The task of a diplomat is to maintain contacts with the authorities and society leaders, so dribbling basketball with the administration chief of the Russian president, playing buskashi with Afghans in Kabul - engaging in what one might call “sport diplomacy” - is part of the job. While such informal contacts might provide a wealth of insights into the unofficial workings of a foreign country, Vygaudas Ušackas, the EU Delegation chief in Russia, admits he is not “in the business of prophecies” to tell how long the Russian-Ukrainian conflict can last. Appointment to Moscow is quite a challenge even to a season diplomat like Ušackas, 50, who previously served as the EU appointee in Afghanistan. "When I arrived here in Moscow two years ago, the outlook was very different," Ušackas explains. "We hoped to be able to develop and deepen our cooperation. Unfortunately, this all changed with the Crimea and its illegal annexation, followed by the destabilization in Eastern Ukraine." Still, the job of a diplomat, he says, is to be the last line of contact between countries that otherwise give one another the worst of silent treatment. And Ušackas takes his role seriously - sometimes to the detriment of his own popularity at home where, as rumour has it, he has ambitions to run for president in 2019. With tensions between Vilnius and Moscow at their highest since the 1990s, any intimation of trying to talk to Russia is taken as a provocation. Ušackas attracted a great deal of criticism a few times when he did just that. Last October, while giving a talk at a university in Kaunas, the EU diplomat said that the Lithuanian media is slightly biased when it comes to reporting on Russia and the Ukraine crisis. While the media were predictably indignant, even Foreign Minister Linas Linkevičius commented that he did not share Ušackas' view. There was even more clamour this January, when Ušackas shared a photo on Facebook of himself playing basketball with Sergey Ivanov, the chief of staff of the Russian president. This was "basketball diplomacy", Ušackas explained, an informal way of doing his job. On that same weekend, unfortunately, Russian-supported rebels attacked the city of Mariupol in south-east Ukraine, killing 30 civilians. Playing ball with one of the chief figures in the Kremlin, which was orchestrating the aggression, was in bad taste, some analysts then said. 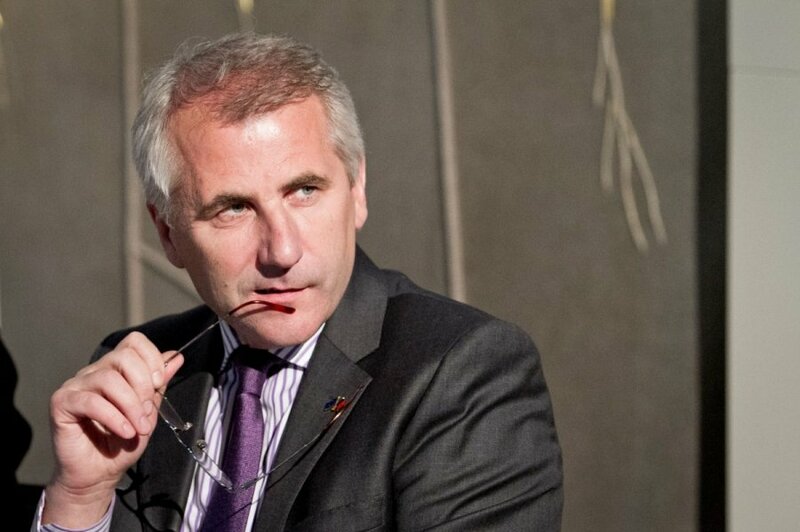 "The task of a diplomat is to maintain relations with the official authorities and different representatives of the society," Ušackas defends his position. "In my 25-year diplomatic carrier, I have always employed and promoted sports diplomacy: playing basketball with congressmen in the US, golf with politicians and businessmen in Britain, buskashi with Afghans. And I will continue to do so with the Russians, be it on the basketball court or football field. It is important to promote dialogue, to hear their views and to convey the EU positions, especially to the high ranking officials, but not only." Amidst rhetoric of a second cold war, Ušackas sees his mission as more important than ever, all the while acknowledging that Moscow is the one responsible for the cold spell in relations. "Russia has been assisting the separatists in many different ways in violation of Ukraine’s territorial integrity," he says. "We remind the need to respect ceasefire and stop military activities, withdraw heavy weapons and implement all points of the Minsk agreements." The EU is following a two-track approach to the Ukraine crisis, Ušackas says, looking for a peaceful diplomatic solution on the one hand and, on the other, maintaining pressure on Russia with sanctions. When asked about military aid to Kiev, however, Ušackas is insistently diplomatic: "For the EU, a lasting ceasefire remains key to the success of current efforts to reach a sustainable political solution, based on respect for Ukraine's sovereignty and territorial integrity. The EU stands united by Ukraine and in urging for full implementation of the package of measures for implementation of the Minsk agreement." The EU's main focus, meanwhile, is on assisting Ukraine economically. Last year, it signed an association agreement, hoping to alleviate economic pressures on the country and help it move on with necessary reforms. "The association agreement together with the free trade agreement is a way to accelerate the necessary reforms and improve the economy, as the agreement gives access to the EU market for Ukrainian companies and the EU and its member states now offer a lot of technical assistance in many political fields," Ušackas says. "Commissioner Johannes Hahn, in charge of European Neighbourhood Policy, visited Kiev recently to discuss support for implementation of the Minsk agreements and Ukraine's continuing urgent need for internal reforms. "At the request of the government in Kiev, the entry into force of the free trade agreement has been phased: the EU market is now open to Ukrainian companies, but only beginning next year will the Ukrainian market be open to EU companies under the new agreement." More access to EU markets is of vital importance to Ukraine right now, as Moscow is pressuring the country not just militarily, but also economically, Ušackas says. "Russia is exercising economic pressure on Ukraine. Since the beginning of the conflict, several normal trade patterns have been cut or sharply reduced; for instance the import of many Ukrainian agriculture products and several industry products." Would it be possible to envisage Ukraine moving towards full membership in the EU? Again, Ušackas is cautious. "For the time being, it's not relevant to discuss membership. In principle, the EU remains open to European countries that want to and satisfy the so-called Copenhagen criteria. But what is important to remember today is that Ukraine is a sovereign country which has a right to choose its own orientation. The EU's aim is to bring about a solution that respects Ukraine's territorial integrity, sovereignty and independence as well as international law." As to how long the current crisis might last, Ušackas refuses to speculate: "I'm not in the business of prophecies." "Let's first hope that Russia will realize from a sober calculation that it's in her own interest to help bring about an end to the conflict in Ukraine. The conflict has already changed the Russian society and it risks propelling Russia back to something we left more than 20 years ago. I'm not sure Russians really want this. "But if we speak about sanctions, these can be scaled up or down depending on the situation. At that same time as we try to engage Russia, we are taking concrete steps to organize our own affairs with stronger internal links and infrastructure. But let's hope that Russia, again from the sober analysis, will realize that turning the relationship into rivalry will be detrimental for Russia herself. Most Russian leaders speak of the need for economic development and modernization. This will not come if Russia isolates herself or turn the back to its key partner, Europe."